Marjorie Daingerfield, daughter of renowned Southern artist, Elliott Daingerfield, was born in New York City. She was a sculptor, author and teacher. She studied at the School of American Sculpture; Grand Central School of Art and with James Fraser, Edmond Amateis, Mahonri Young, Solon Borglum, Brenda Putnam, Isadore Konti and Anna Hyatt Huntington. Marjorie Daingerfield was a member of the Audubon Society of Artists; the Pen and Brush Club; Catherine Lorillard Wolfe Art Club; the National Sculpture Society, fellow, and the Blowing Rock Art Association. She exhibited at the Mint Museum of Art; National Sculpture Society; Pen and Brush Club; Catherine Lorillard Wolfe Art Club; National Academy of Design, 1926-1945; and Duke University, NC; Norton Art Gallery; Windenstein Gallery; Grand Central Art Gallery. Daingerfield won awards: Pen and Brush Club, Anna Hyatt Huntington Award for Bronze and Catherine Lorillard Wolfe Art Club Award for Life with Father. Her work is at the School of Tropical Medicine, San Juan, PR; Museum of City New York; Georgetown University, Washington, DC; NC Museum of Art, Raleigh; Mint Museum, Charlotte, NC; Queens College, Charlotte, NC. 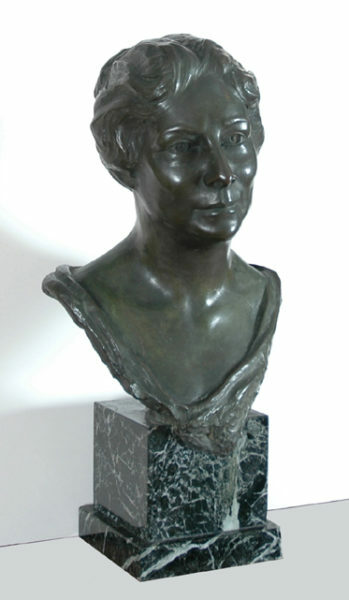 Daingerfield’s commissions were Indian head (bronze), Hobart College, New York; Dr. Bailey Ashford (portrait head in bronze), the School of Tropical Medicine, San Juan, PR; Dr. C.C. Carpenter (portrait head), Bowman Gray School of Medicine, Winston-Salem, NC; The Offering(bronze statue), St. Mary’s of the Hills, Blowing Rock, NC. She was a lecturer and demonstrator on sculpture at various university clubs, Richmond, VA, Winter Park and Palm Beach, FL and art groups in New York. She taught sculpture at Grand Central School of Art, Rollins College, Norton Gallery and School of Art. Daingerfield wrote “The Fundamentals of Sculpture”. Her preferred media was bronze and marble. Markings signed on back, inscribed Roman Bronze Works, N.Y.